The Puerto Rico Tip-Off – to be held Thursday, Nov. 17, Friday, Nov. 18 and Sunday, Nov. 20 – will move its site for the 2016 event to ESPN Wide World of Sports Complex at Walt Disney World Resort near Orlando, Fla. Previously held at the Coliseo Roberto Clemente in San Juan, Puerto Rico, the tournament has been moved due to concerns over the Zika virus. Now branded the Tire Pros Invitational, the tournament’s field will remain as originally announced with Arizona State, Clemson, Davidson, Missouri, Northern Iowa, Oklahoma, Tulane and Xavier. The bracket consists of 12 games over three days with each team competing in one game per day, advancing through the bracket. The two teams that remain undefeated throughout will face off in a championship game on the final day of competition. The previously announced times and networks of each game will remain the same. 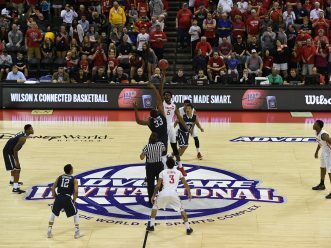 The Tire Pros Invitational is one of two premier men’s college basketball tournaments that will be hosted at ESPN Wide World of Sports Complex this season, as the 2016 AdvoCare Invitational takes place over Thanksgiving weekend, Nov. 24-27. This year’s field features Gonzaga, Iowa State and Miami, Seton Hall, Florida, Indiana State, Quinnipiac and Stanford. The Tire Pros Invitational and AdvoCare Invitational are owned and operated by ESPN Events, a division of ESPN.